How does the Community Plan Update affect you and your community? Come out to learn more about how Community Plans work and what the update process is about. Here’s how to get involved! The Department of City Planning and the Department of Neighborhood Empowerment will host two Planning 101 trainings this month. The trainings will provide an overview of the community planning process, how the community plans work and the basic elements of planning, land use and zoning. Please join us at one of our upcoming Planning 101 trainings and invite a friend! There will be games and raffles! A phone call-in option is available. 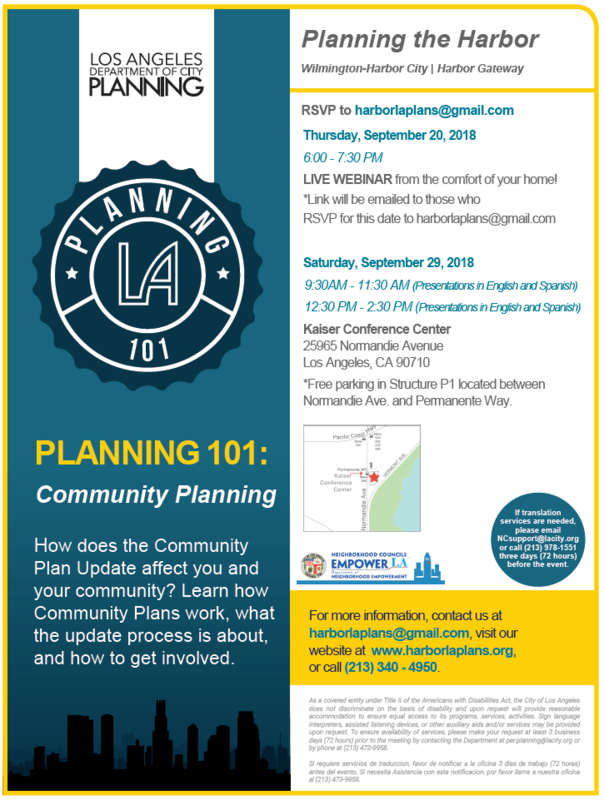 We kindly ask you to RSVP for one of the trainings at harborlaplans@gmail.com or call (213)340-4950. The RSVPs will inform us how many materials we need to prepare. Please specify which session you will be attending.